This Chicken Broccoli Rice Casserole is made with delicious ingredients and is a wonderful all-in-one-meal! It is made with a homemade mushroom soup recipe which really adds to the incredible flavor. This will be an instant new family favorite! I have been feeling like my life is in overdrive lately. There is so much to get done and so little time. Don’t you love that feeling?… NO? Yeah, me either! When life gets crazy I love an all-in-one meal. They are so easy and so yummy! 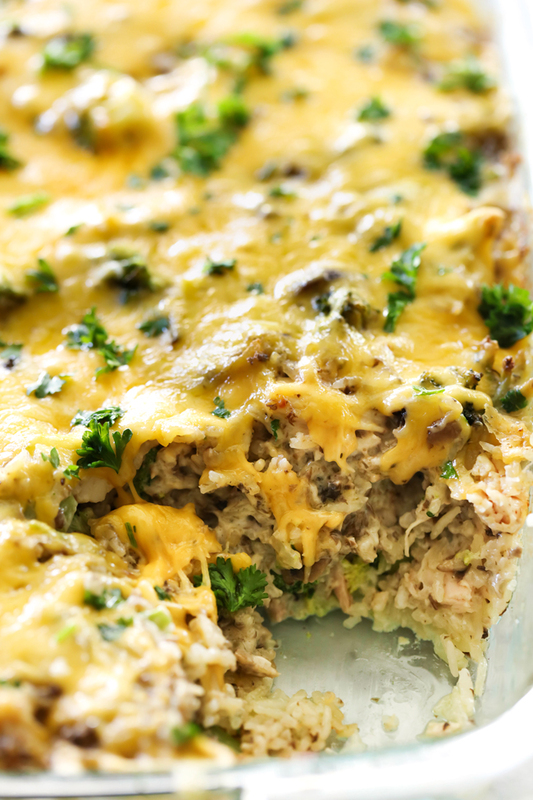 This Chicken Broccoli Rice Casserole is one my mom made often growing up. It uses a Homemade Mushroom Soup recipe that will blow your mind! It compliments and pairs so wonderfully with the chicken, broccoli and rice and makes for an unbelievably tasty dinner! My family goes crazy over this one. If you are looking for a meal that is simple and will be a new family favorite, give this a try! You will not be disappointed! 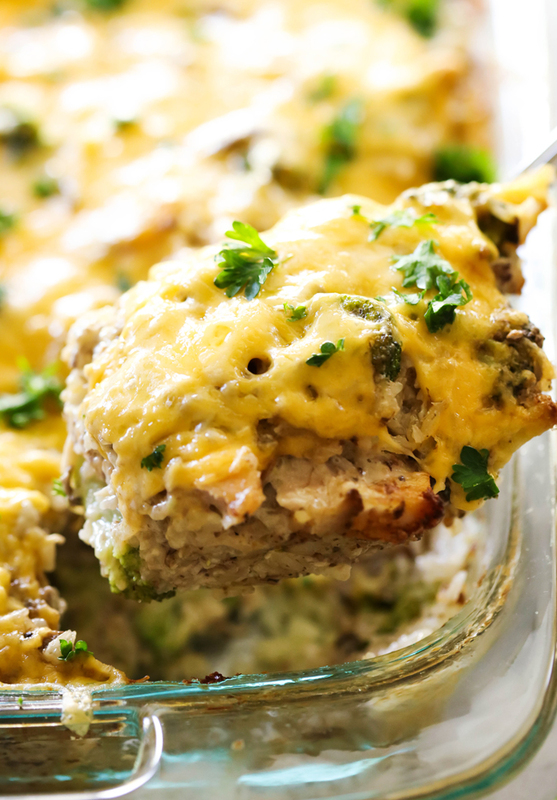 This casserole is made with delicious ingredients and is a wonderful all-in-one-meal! It is made with a homemade mushroom soup recipe which really adds to the incredible flavor! This will be an instant new family favorite! In a large sauce pan melt ¼ cup butter. Add mushrooms and garlic salt. Cook until mushrooms are tender. Drain and set aside. In a large sauce pan over medium heat, melt ¼ cup butter. Add flour and cook for 1 minute. Slowly add half and half and heavy cream, and milk. Add minced onions, garlic powder, salt and pepper. Bring to a boil and cook for 2 minutes. Spray 9x13 baking dish with cooking spray. Add broccoli, rice, 1 cup cheese, and chicken. Toss carefully until well mixed. Pour mushroom sauce over rice and mix well. Remove from oven and add sprinkle remaining cheese over casserole and return to oven for 5 minutes until cheese is melted. Half and Half is found at most grocery stores next to the heavy whipping cream. It is a blend of equal parts milk and cream. Have you ever frozen this successfully? The mushroom sauce looks delicious! However, your instructions on how to make it, conclude with, "add mushrooms and serve." I believe it is to be added to the rice and broccoli casserole? Thank you for the tasty recepes you share. They are truly delicious! sorry about that typo! All fixed now- thanks for catching that! Looks delicious. Can I substitute something for the flour (cornstarch maybe) to make this recipe gluten free? Made this last night. It's really good! The only difference I made was that I didn't use dry minced onions. Instead, I diced a whole onion and tossed it in with the mushrooms as I cooked them. I will definitely make this again in the future, but with one change. Next time I will use 2 bunches of fresh broccoli, but I will steam it a bit before adding it in to soften it up. There's nothing wrong with using frozen broccoli. My only gripe is that the frozen broccoli bags have mostly stems and barely any actual florets. But that's an issue with those companies who process it. This recipe though is great!